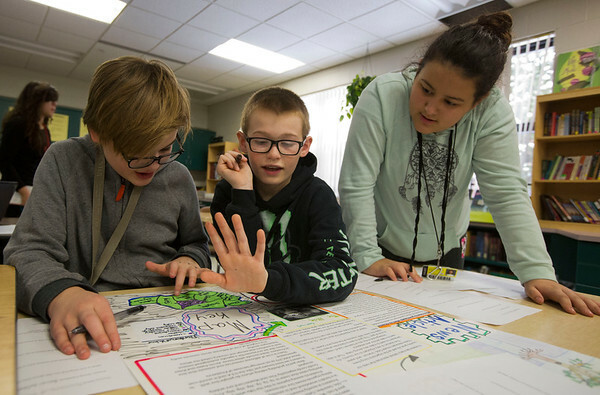 Goshen Middle School sixth grades, from left, Daniel Edmonds, Preston Heeter and Briana Herrera Carranza discuss the imaginary country of Frontera during class on Tuesday afternoon. For the past six weeks, groups of sixth grade students have been creating make believe countries during their humanities classes. The students are responsible for developing everything from the landform, shape and natural resources each country possesses to the language and constitution each country abides by. On Tuesday, the students had a chance to view and leave feedback about their fellow classmates’ countries.